It is a unique solution to a problem that is plaguing national parks all over Indonesia: instead of trying to evict local communities, who have long lived within the boundaries of these protected areas, carve out an “eco-village,” where they can still make use of nuts, berries, medicinal plants and other non-timber products collected from the tropical forests. 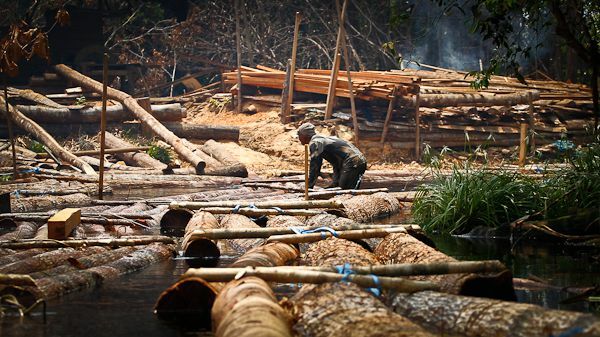 Various local groups are making claims in Kutai National Park in East Kalimantan province based on historical rights of access, raising complex legal and governance issues and hampering conservation of an area that has already been subjected to logging, coal mining and oil exploration activities. Though this is presenting special challenges, it is unfortunately not unusual in a country where many of the 50 national parks are, in effect, “parks that exist solely on paper”. Central Kalimantan, Indonesia. Photo: Achmad Ibrahim/CIFOR. Most were established by the national government through decrees that don’t account for different types of local communities that have long inhabited them, and where local governments are authorised to issue concession permits despite the park’s designated status as protected. To reconcile the demands of the various local groups making claims on land within Kutai, a new CIFOR report presents a proposal put forth by a coalition of researchers, non-governmental organizations and business representatives. They advocate the need to strengthen polices that allow for the creation of “special use” zones, areas where local communities would have the right to use forest resources, whilst at the same time abiding by regulations to maintain the park’s protected area status. Although current regulations do allow for the establishment of special zones within the park, they do not go far enough to ensure that the use of forest resources by the various communities are compatible with conservation efforts and neither do they legitimately recognize the rights of communities in management of the park, said Moira Moeliono, co-author of The challenges of developing a rights-based approach to conservation in Indonesia. “A set of ‘special rules’ would need to be designed collaboratively with clearly defined rights and responsibilities, which would then be submitted and approved by the Park administration,” she added. “For example, local people might be given the rights to live and make a living within the park with some restrictions to allow conservation. For this they might be given the rights to compensation for the constraints put on them. At the same time they have the responsibility to protect the core areas from encroachment, participate in monitoring and ensure conservation of endangered species”. 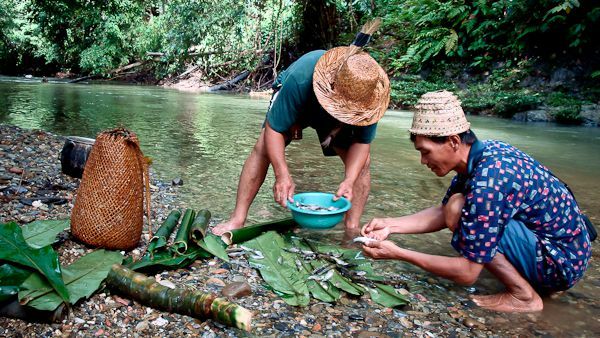 Dayak people preparing fish for eco-tourists. Photo: Citt Williams/UNU. When Kutai was designated as the country’s first national park in 1995, Bugis migrants from South Sulawesi were already settled in the area and claimed ownership of their land. Four years later, the provincial government (ignoring the park’s protected status) carved out 23,000 hectares from the park to accommodate them. This encouraged the migration of other local communities into the park and was followed by the construction of a road, gas stations, bus terminals and communications towers. 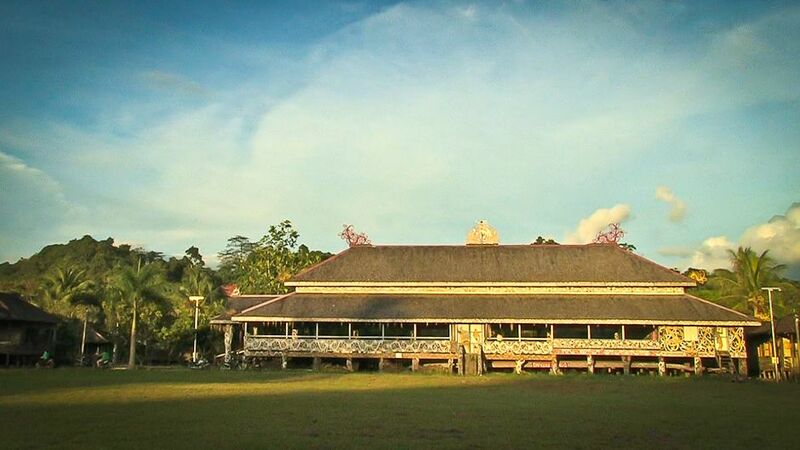 In 2007, indigenous Dayak and Kutai people claimed “ownership” of an additional 100 hectares of the park based on their historical rights of access to the land as indigenous people of Kalimantan. “The question of which local group deserves recognition of their land claims proves to be a very tricky one,” says the report. While the sale of land in a national park is illegal under Indonesian law, the report notes many of the residents have sold parcels to people from the surrounding towns, further complicating the issue of land rights in this protected area and raising the question of what rights the buyers now have over the property. Furthermore, local administrations have reportedly issued land ownership certificates that threaten to place plots in the hands of owners who may be willing to sell to coal mining or logging companies. The special-use zone is not only about recognising and protecting local rights but could also provide a mechanism for seeking redress when rights are denied, said Moeliono. However, a lot of work still needs to be done to create the legal basis from which a zoned area could be managed in order to deal with these grievances, she argues. This article appears courtesy of CIFOR’s Forests News blog. Eco-villages Instead of Eviction: a New Approach in Indonesia by Rachel Rivera is licensed under a Creative Commons Attribution-NonCommercial-ShareAlike 3.0 Unported License. Based on a work at blog.cifor.org/13693/eco-villages-instead-of-eviction-a-new-approach-to-the-people-in-parks-problem-in-indonesia. Rachel Rivera is a freelance writer and editor, with a special interest in environmental issues. She has worked as an editor for The Associated Press in New York and Thailand, and for the Natural Resources Defense Council magazine in the United States. She has a Master of Journalism degree from the University of California, Berkeley. She is presently based in Jakarta.